Hunter’s Camp will be included in Melissa Speidel’s forthcoming catalogue raisonne of Albert Bierstadt’s works. A letter from Melissa Speidel will accompany this lot. In 1889, Albert Bierstadt made a tour of the Canadian Rockies, Oregon, Washington, and the Northwest and Alaskan Coasts. While there he saw trainloads of buffalo bones, vast wildfires, and massive glaciers. On a tour of Loring Bay, Alaska, the steamer he was traveling on–the Ancon–ran aground. Bierstadt and the other passengers had to stay on shore for several days, living in Native huts and salmon canneries, until another steamer reached them. Bierstadt used his time to sketch and paint, though, as Melissa Speidel writes, “Not many of Bierstadt’s oil studies from his time in Alaska have been located, and there are few finished oils. 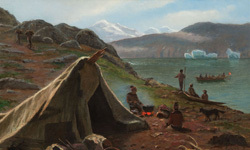 Scenes such as Hunter’s Camp give us a welcome view of the artist’s Alaskan experience.” The makeshift shelters of sailcloth and broken spars suggest that Hunter’s Camp, painted in New York on his return, may have been inspired by similar encampments he saw during his predicament. Original canvas. Fine craquelure throughout, does not affect appearance.